The War on Poverty is the unofficial name for legislation introduced by United States President Lyndon B. Johnson during the State of the Union on January 8, 1964. This legislation was proposed in response to a national poverty rate of around nineteen percent. His speech rallied Congress to pass the Economic Opportunity Act, which established the Office of Economic Opportunity (OEO) to administer the local application of federal funds targeted against poverty. The Great Society was a continuation of Franklin Delano Roosevelt’s New Deal, which ran from 1933 to 1935, and the Four Freedoms of 1941. The popularity of a war on poverty waned after the 1960s. Deregulation, growing criticism of the welfare state, and an ideological shift to reducing federal aid to impoverished people in the 1980s and 1990s culminated in the Personal Responsibility and Work Opportunity Act of 1996, which, as claimed President Bill Clinton, “end[ed] welfare as we know it.” The late historian, Prof. Tony Judt, said in reference to the earlier proposed title of the Personal Responsibility and Work Opportunity Act that “a more Orwellian title would be hard to conceive” and attributed the decline in the popularity of the Great Society as a policy to its success, as fewer people feared hunger, sickness, and ignorance. Additionally, fewer people were concerned with ensuring a minimum standard for all citizens and social liberalism. The last book he published was Ill Fares the Land only a few months before he died, where he plotted the rise and fall of the War on Poverty. Nonetheless, the aftermath of the War on Poverty remains in the continued existence of such federal programs as Head Start, Volunteers in Service to America, and Job Corps. 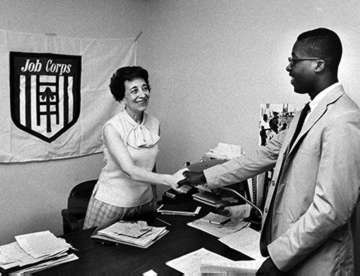 The OEO launched Project Head Start as an eight-week summer program in 1965. The project was designed to help end poverty by providing preschool children from low-income families with a program that would meet emotional, social, health, nutritional,and psychological needs. Head Start was then transferred to the Office of Child Development in the Department of Health, Education, and Welfare (later the Department of Health and Human Services) by the Nixon Administration in 1969. President Johnson also announced a second project to follow children from the Head Start program. This was implemented in 1967 with Project Follow Through, the largest educational experiment ever conducted. The policy trains disadvantaged and at-risk youth and has provided more than 2 million disadvantaged young people with the integrated academic, vocational, and social skills training they need to gain independence and get quality, long-term jobs or further their education. Job Corps continues to help 70,000 youths annually at 122 Job Corps centers throughout the country. Besides vocational training, many Job Corps also offer GED programs as well as high school diplomas and programs to get students into college. Making poverty a national concern set in motion a series of bills and acts, creating programs such as Head Start, food stamps, work study, Medicare and Medicaid, which still exist today. The programs initiated under Johnson brought about real results, reducing rates of poverty and improved living standards for America’s poor. large-scale national programs aimed at helping the poor and needy that consumed nearly 1.2 percent of the nation’s gross domestic product (GDP). The programs were meant to be temporary, short-term investments. Instead they have become permanent fixtures in government programming and spawned the creation of dozens more programs over the years. Today, spending on welfare programs (adjusted for inflation) is 13 times greater than it was in 1964. It is clear that President Obama is intent on not only continuing the failed war on poverty but expanding and growing the size of the welfare state. President Obama’s 2011 budget will increase spending on welfare programs by 42 percent over President Bush’s last year in office. Total spending on the welfare state (including state spending) will rise to $953 billion in 2011. Further, the Obama Administration is pursuing a change in the official “poverty measure” that will increase the number of people considered poor in America. If future program eligibility is tied to this measure, the amount of federal tax dollars flowing to programs aimed at helping the poor would dramatically increase. Means-tested welfare spending or aid to the poor consists of government programs that provide assistance deliberately and exclusively to poor and lower-income people—for example, food stamps, public housing, Medicaid, and Temporary Assistance for Needy Families. There are currently over 70 different federal means-tested programs on the books. In fiscal year (FY) 2008, total government spending on means-tested welfare or aid to the poor amounted to $714 billion. Of that, $522 billion (73 percent) was federal expenditures and $192 billion (27 percent) was state government funds. Nearly all state welfare expenditures are matching contributions that the federal government requires of its welfare programs, a “welfare tax” that the federal government imposes on the states. Total means-tested welfare spending in FY 2008 amounted to around $16,800 for each poor person in the U.S.
Each year, the U.S. Census Bureau calculates what the national poverty rate is and how many people are living in poverty. For 2008, the poverty rate was about $22,000 for a family of four. There were approximately 39 million people considered living at or below the poverty rate. Means-tested programs are limited to those at or below the poverty line. However, many welfare benefits go beyond this threshold to include persons who have incomes below 200 percent the poverty level, or about $44,000 per year for a family of four. Close to one-third of the U.S. population falls within this income range. A family of four at this income level would be eligible for approximately $28,000 worth of federal and state welfare benefits per year. Of the 70 different means-tested programs run by the federal government, almost all of them have received generous increases in their funding since President Obama took office. Some have also been expanded to include more people who would be eligible for the benefits. A good example of this is food stamps, officially known as Supplemental Nutrition Assistance. The President’s 2011 budget requests that food stamps spending rise from $39 billion (already a record level) to $75 billion. 2011 budget also requests these expansions be permanent. In addition, eligibility for this program was expanded in the “stimulus” package. In President Obama’s first year in office, food stamp rolls grew by over 5 million people—the single largest increase in a one-year period in over three decades. The Obama Administration announced that it is creating a new poverty measure to be unveiled in the fall of 2011 that would redefine who is considered “poor” in America. This new measure will dramatically increase the number of people considered to be living in poverty in the U.S.
New York City recently adopted a similar poverty measure. Under the current federal measure, the city’s poverty rate fell from 19.1 percent in 2005 to 17.76 percent in 2008. However, under the new poverty measure the 2008 rate rose to 22 percent. The translation of these numbers into federal dollars for benefits would be significant. Only one of the 70 federal welfare programs, the Temporary Assistance to Needy Families program, has work requirements for its recipients. The 69 others merely provide a basic need and allow families to stay on the welfare rolls indefinitely.